Save time, consolidate your high volume mail with mailbags and mailbag holders. Be more efficient by sorting high volume mail to branch offices and satellite mail centers. This stationary mailbag rack holds one mailbag on quick release hooks - it is perfect for office, mail center and warehouse use. Mailbag rack only, mailbags sold separately see links below. Mailbags are sold separately, see part number 38N for colored vinyl mailbags or our part number 38 white canvas mailbags. • Base units hold 1 mailbag (mailbag sold separately, see above). • Frame is zinc-plated. heavy-gauge steel tubing to stand up to heavy use. Add optional ID labels (Part L29) to make identifying the mailbags easier. 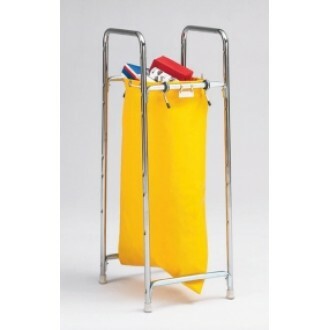 We have a variety of mailbag holders to fit your exact needs, for our 2 bag holder see part MB42.